Carlos' superpowered guitar is mesmerizing, the entire atmosphere is otherworldly, beautiful, modern jazzy and most of all, electrifying. His guitar tone is perfect, each solo has a central rhythmic and melodic structure that was used to express in a moment what can never be repeated. The greatness of Lotus is its ability to take all of Carlos' beautiful melodies and expand them each into a whole new creation. Santana fans know there are “several different Santanas.” This was the MILES Santana, the COLTRANE Santana. This is intense and awe-inspiring music played with so much mind-numbing passion. Carlos' guitar speaks notes on this recording that are nothing short of extraordinary. He manages to imbue a vibration that cuts right through your soul. Even on the familiar hits, the jazz fusion makes its way into the notes and Carlos delivers a new message. This was the top of Santana's spiritual-fusion era. 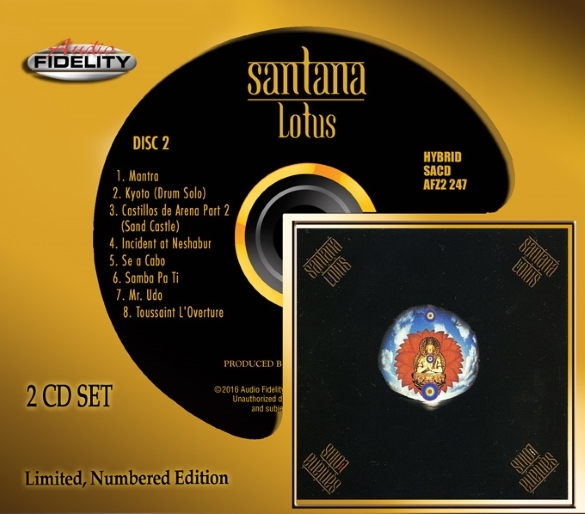 Lotus is the Live Santana album that gives other Live albums a bad name. Spectacular, breathtaking, emotional, spiritual...and it rocks!